Mo chlann féin ag díol a máthair..."
Is cóir na suíomhanna seo a bheith ag freastal ar lucht na Gaeilge. Is Pairtithe Politiúla, Rannaí Stáit, Rialtas Áitiúil, Comhlachtaí Stáit, na hEaglaisí, agus eagrais agus comhluchtaí atá lonnaithe sa Gaeltacht. Is náireach nach bhfuil Stáit na hÉireann agus na suíomheanna eile sásta seasamh leis an teanga - an taon teanga amháin gur féidir linn a rá gur linnne í.
Seo pictiúr den comhartha a fhógraíonn go bhfuil duine ag dul isteach ar an nGaeltacht ag Bearna. Tá sé mar seo le breis is dhá mhí anuas. 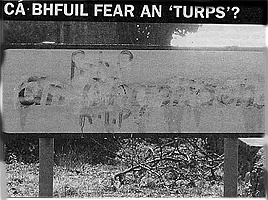 Is cuimhin liom cloisint ar RnaG seachtaine ó shin go raibh Údaras na Gaeiltachta duine a chuir aniar le "turps" chun é a glanadh. 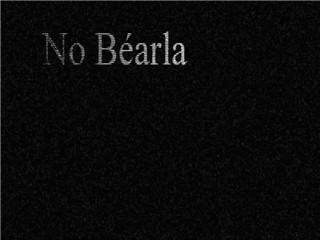 Tá fhios ag cach go bhfuil an trácht go dona i mBearna. Idir an dá linn tá an comhartha imithe ón áit! Leathanaigh i dteangacha seachas Gaeilge a bheadh spéis ag Gael ionta. Ait go leor níl ach Béarla ar an suíomh seo! Suíomheanna sa Ghaeltacht nach bhfuil Gaeilge ionta! "Cuimhnigí, gur fada chugainn anall a tháinig an Ghaeilge, agus an croí mór bog Gael a ghabhas léi, agus gur foghail thar foghla is creach thar creacha an domhain, an croí gan cor sin agus an teanga chaoin cheansa sin a scarúin linne and lenár sliocht inár ndiaidh go deo."